Caesar: Conquest of Gaul Module #1. Part of the GBoH (Great Battles of History) series. Caratacus covers both the main battle and the last battle in the efforts of Rome, and the Emperor Claudius, to conquer the Britons and enlarge the empire's boundaries. The Roman legions and the commanders sent to accomplish this were of the highest ability available. The Britons were still a mobility-oriented, light army. However, her nominal leader, Caratacus, chief of the Catuvellauni, was as wily a "barbarian" commander as could be found in this era. 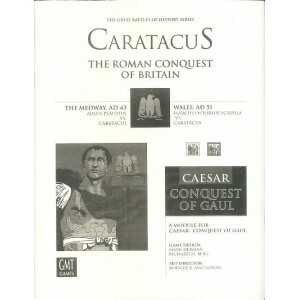 To play Caratacus, you need a copy of Caesar: The Conquest of Gaul.